This is further to the Notification S.O. 639(E) from the National Pharmaceuticals Pricing Authority (NPPA) dated 12 Feb 2018 on capping the prices of Coronary Stents in India. 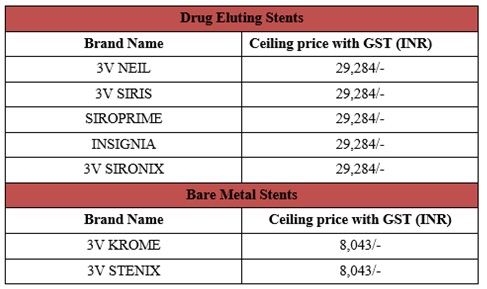 Presuant to the above mentioned order of NPPA, please find the below new ceiling price of Drug Eluting Stents and Bare Metal Stents manufactured by S3V Vascular Technologies Pvt ltd, with immediate effect from 13.02.2018 to 31.03.2019.